Nonelderly Medicaid patients do use EDs at higher rates than nonelderly privately insured patients. 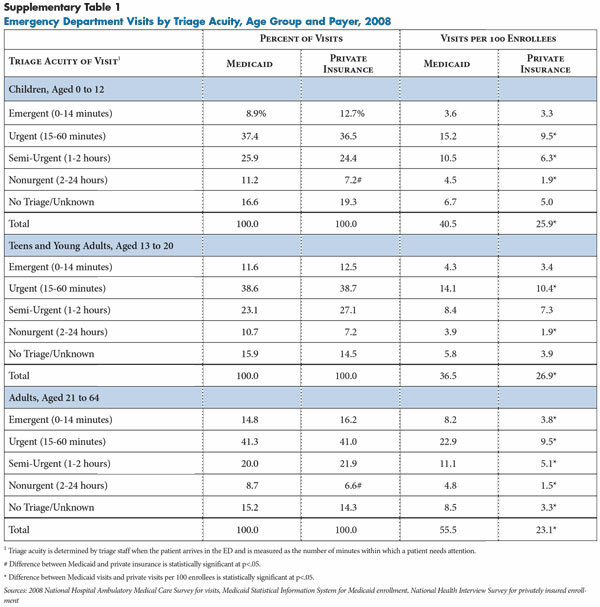 In 2008, people aged 0 to 64 covered by Medicaid had 45.8 ED visits per 100 enrollees compared with 24.0 visits per 100 nonelderly privately insured people, according to the most recent data available from the National Hospital Ambulatory Medical Care Survey (NHAMCS) (see Table 1 and Data Source). Across children and working-age adults with Medicaid, all age groups mirror a pattern of higher rates of ED use than the privately insured, including children aged 0-12, teens and young adults aged 13-20 and adults aged 21-64.5 However, this study’s findings indicate that Medicaid patients’ higher rates of ED visits are not disproportionately for minor health concerns when compared to privately insured patients. wo kinds of information from emergency department visits generally are used to explain ED use—patients’ symptoms when they arrive at the ED and their diagnoses when they leave. The urgency of symptoms can help explain why a patient chose an ED for care rather than another setting, such as a primary care physician office or clinic. (5) no triage or unknown triage. 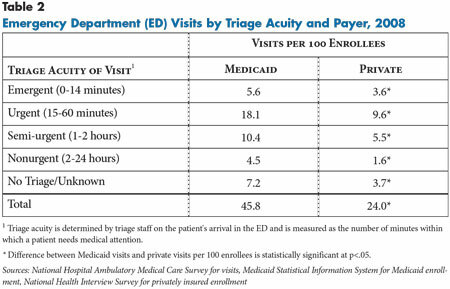 About 15 percent of both Medicaid and privately insured ED visits in the 2008 NHAMCS lack assignment of triage acuity for a variety of recordkeeping reasons. The second kind of information used to explain ED use is the physician’s diagnosis after examining and evaluating a patient in the emergency department. Diagnoses often are cited as evidence that many ED visits are unnecessary. However, using diagnoses to determine whether a specific patient needed to use an emergency department is inappropriate because the triaging clinician—and patient—don’t have the full clinical picture until after a physician examines the patient.6 An exam or test often rules out a more serious diagnosis that was a concern during triage, and symptoms that appear frightening to a patient can turn out to have an easily treatable cause (see box below for more about the urgency of symptoms). When examined on a population basis rather than the individual-patient level, however, diagnoses related to ED visits can be a useful research tool to help answer questions about how much care provided in emergency departments might be provided in other settings. This study uses both kinds of information—symptoms and diagnoses—to examine the composition of ED visits nationally, with the caveat that neither provides the whole story about why a particular patient went to an emergency department. A visit’s triage acuity can look like a misjudgment once a diagnosis is made because the triage measure reflects only a patient’s presenting symptoms, while the diagnosis does not convey the urgency or severity of symptoms. Moreover, missing from NHAMCS data are the circumstances prompting a patient to seek care, whether or not a patient has a usual source of care and what advice that source may have given, how long ago the symptoms arose, and how the patient interpreted them. The severity of a child’s infection can be especially difficult for a parent to assess because children often can’t communicate the extent of their discomfort and can have symptoms common to both benign and dangerous conditions. For example, infants can vomit, develop high fevers and refuse to sleep in response to ear infections, which are relatively benign and easily treatable. Yet, this trio of symptoms also occurs in the presence of severe systemic infections that can lead to dehydration and require hospitalization. The underlying diagnosis may not become evident until a clinician examines the child or later as the child’s symptoms evolve. When primary care clinicians can’t see a child quickly, the only available option may be an emergency department. Adults may seek rapid treatment from a physician when symptoms are extremely uncomfortable or painful and worrisome, even if not life-threatening. A woman with a urinary tract infection (UTI) may be unable to sleep from extreme discomfort and may find it physically intolerable to wait days for an appointment. UTIs often require a prescription antibiotic, and primary care providers can be reluctant to prescribe medication based on a phone consultation. Depending on how long ago symptoms began and when an appointment is available, both a primary care clinician and the patient may view an ED as the best place to seek care. These scenarios underscore the difficulty patients and clinicians have in judging the urgency of symptoms. This challenge underscores that appropriateness of a particular decision to seek care can’t be determined when a symptom arises. There are many gray areas and uncertainty about what risks patients face when deciding how long to wait to seek treatment and where to go for treatment. Medical problems cannot be neatly divided into categories of urgent and nonurgent without a clinician’s medical judgment. ontrary to the conventional wisdom that Medicaid enrollees often use emergency departments for routine care, nonurgent visits explain only a small portion of nonelderly Medicaid enrollees’ higher emergency department use. Nonurgent visits represented 10 percent of ED visits paid by Medicaid and 7 percent of ED visits paid by private insurance for nonelderly people nationally in 2008 (see Figure 1). 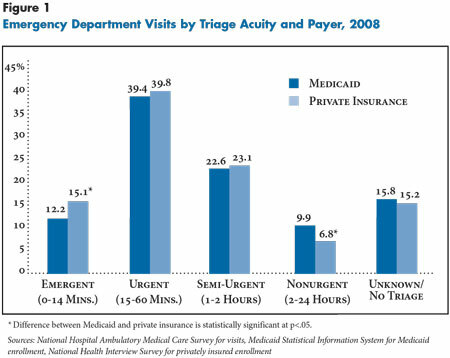 In contrast, slightly more than half of Medicaid and private visits were categorized as emergent or urgent. Thus, differences in the rate of nonurgent visits per 100 enrollees between Medicaid and privately insured patients accounted for only 13 percent of the total difference in ED visit rates (findings not shown). Most of the difference in ED use between nonelderly Medicaid and privately insured patients results from more ED use by Medicaid patients for urgent and semi-urgent symptoms (see Table 2). Medicaid patients were seen in EDs for urgent visits—needing evaluation within an hour—at the rate of 18.1 visits per 100 enrollees vs. 9.6 visits per 100 privately insured people. For semi-urgent visits—evaluation needed in 1 to 2 hours—people covered by Medicaid patients were seen at the rate of 10.4 visits per 100 enrollees vs. 5.5 visits for privately insured people. The same pattern held across all age groups but was most pronounced among adults aged 21 to 64 (see Supplementary Table 1). handful of conditions account for more than half of all ED visits by both privately insured and Medicaid-covered children aged 0 to 12 years: acute respiratory and other common infections and injuries. Together, these conditions accounted for 53 percent of ED visits by children with Medicaid and almost 60 percent of all visits by privately insured children. Very few other condition groups account for a large enough share of visits that, if redirected to other care settings, could have a real impact on patient volume in emergency departments. This is strong evidence supporting the idea that settings other than emergency departments could manage a large share of visits by children, but these settings would require capacity to treat 1) urgent and common childhood infections; and 2) minor or uncomplicated injuries. Children aged 0 to 12 with Medicaid sought care in emergency departments for acute respiratory conditions and other common infections at a significantly higher rate than children with private insurance—12.7 vs. 5.5 visits per 100 enrolled children, respectively. In fact, these common infections accounted for half of the total difference in visit rates between children with Medicaid and private insurance. Children with Medicaid also sought care at higher rates for other infections—such as pneumonia and influenza—and other usually more serious respiratory diseases—such as asthma—which accounted for another 16 percent of Medicaid-covered children’s ED visits. The same patterns also were evident among teens and young adults aged 13 to 20, although visit rates for these conditions were much lower and differences between payers were less pronounced. Among children younger than 18, the most common reason for physician office visits other than preventive care is acute respiratory infections, sinusitis and bronchitis.8 Almost all children with Medicaid have a usual source of care,9 and most physicians who serve children participate in Medicaid and the Children’s Health Insurance Program (CHIP).10 So, given the urgency of ED visits for these conditions, difficulty gaining timely access to these clinicians may explain why many more children with Medicaid go to the ED for help. Injuries. Fully 38 percent of all ED visits by privately insured children aged 0 to 12 were for injuries—both urgent and nonurgent, compared with 22 percent of visits for children covered by Medicaid. There was no statistically significant difference in the visit rates for injury between the two payer groups—8.9 visits for private and 9.8 visits for Medicaid per 100 enrollees—suggesting that barriers to primary care do not disproportionately affect the care of injuries for children with Medicaid. The same pattern was evident among teens and young adults aged 13 to 20. Some injuries require emergency services, and in other cases, a primary care setting may not offer the right services, such as suturing, or parents may not view primary care as the right place for treatment of injuries. In any case, such factors do not appear to affect children with Medicaid disproportionately. onelderly adults with Medicaid generally have higher ED use across all medical conditions, pointing to well-established health-status differences with privately insured adults: higher illness burden, greater illness severity and higher rates of severe disability.11 Adults aged 21 to 64 with Medicaid use emergency departments at more than double the rate of adults with private insurance for all major diagnostic groups, including respiratory, digestive, musculoskeletal and nervous system diseases. The same pattern was evident among teens and young adults aged 13 to 20, although for a smaller number of diagnostic groups. 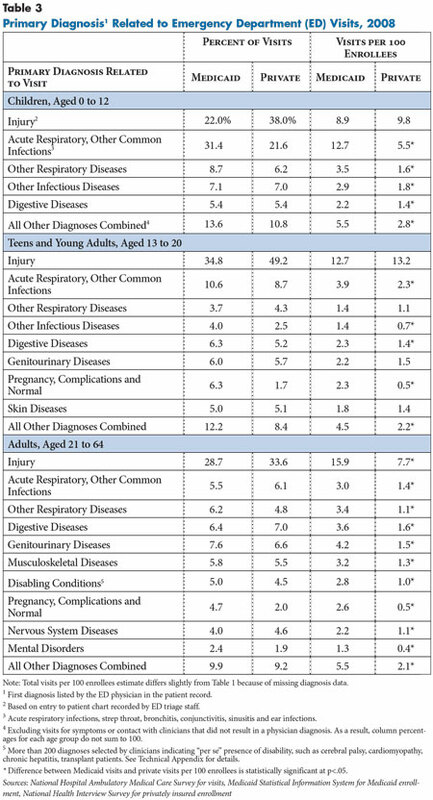 Adults aged 21 to 64 with Medicaid also were three times as likely as privately insured adults to have visits for diagnoses indicating potentially complex needs from pregnancy and disabling conditions, such as cerebral palsy, cardiomyopathy and chronic hepatitis—5.4 visits per 100 Medicaid enrollees vs. 1.5 visits per 100 privately insured enrollees. The diversity of conditions contributing to ED use by nonelderly adults could present challenges for other care settings to accommodate these patients’ urgent needs. Given that high ED use by adults aged 21 to 64 with Medicaid reflects a diverse array of medical conditions, unmet need for specialty care also could be a contributing factor for high ED use. Only 53 percent of specialists in the United States were accepting all or most new Medicaid patients in 2008, compared to the 87 percent accepting all or most new privately insured patients.17 Adults with Medicaid coverage reportedly have difficulty accessing many medical specialties, especially orthopedics, gastroenterology, neurology and dermatology.18 Barriers to specialty care could contribute to high ED use by leaving no alternative source of care other than emergency departments for acute and ongoing symptoms related to chronic conditions. ontrary to commonly held perceptions that Medicaid enrollees often use emergency departments for routine care, the majority of ED visits by nonelderly Medicaid patients are for symptoms suggesting urgent or more serious medical problems. These findings also point to two types of conditions with the greatest potential to reduce ED use for both nonelderly people covered by Medicaid and private insurance if access to appropriate alternative care settings existed—first, acute respiratory and other common infections in children, and second, injuries among all nonelderly people. Information on diagnoses supports the idea that patients who seek ED care for certain conditions could be treated in lower-cost settings, but primary care settings may not be a practical solution for all cases. Many primary care offices cannot see patients quickly enough to manage urgent problems or do not have the right equipment at the practice. Alternative care settings would need to provide prompt care for urgent cases and have appropriate services and equipment to diagnose and treat minor cases. Management of easily treatable infections can require urinalysis or intravenous fluid administration for dehydration, and minor to moderate injuries can entail suturing, X-rays and splinting. The capacity and location of alternative providers—possibly urgent care centers, retail clinics or others—that can handle urgent problems at lower cost than emergency departments will ultimately determine how many patients can be directed to lower-cost settings. increasing participation of providers in lower-cost settings, such as urgent care centers, in health plan networks. However, recent evidence shows that copayments are ineffective in reducing nonurgent ED visits by Medicaid enrollees,22 and such policies raise concerns that low-income patients with urgent concerns will not get needed care. Moreover, some hospitals actively seek to draw patients with minor problems to their emergency departments by advertising short wait times on billboards and through mobile phone applications.23 Broader payment reforms, such as accountable care organizations, that move away from fee-for-service payment could alter incentives for hospitals to market their EDs as aggressively and prompt greater development of lower-cost settings that can deal with urgent medical needs. Encouraging primary care providers to address high ED use through greater adoption of patient-centered medical home (PCMH) practices can potentially decrease ED use, though evidence to date is mixed.24 Some PCMH practices may help patients with chronic conditions to better control symptoms and prevent complications, thereby avoiding the need for emergency care. Many PCMH initiatives also stress enhanced patient access to clinicians outside of normal business hours. Growing pressures on the primary care workforce, however, may limit the impact of PCMH initiatives on ED volume. A significant number of ED users with a primary care physician reportedly are referred to the ED by their physician or called their doctor before seeking care in an ED, so emergency departments already may be handling spillover from overloaded physicians.25 Primary care capacity is likely to be stretched even further in some states because of Medicaid and private insurance coverage expansions scheduled in 2014 under the federal health reform law. Encouraging the development of settings other than primary care that can provide access to urgent care also is likely to be part of the solution to reducing ED use, although few would contend that such settings can replace primary care. Urgent care and retail clinics have been shown to cost payers less per visit than emergency departments for conditions commonly treated in EDs,26 in part because hospital EDs can charge a significant facility fee. And, many commercial health plan provider networks include retail clinics and urgent care centers, but there is no evidence yet of the overall cost-effectiveness of these strategies. Moreover, just as many primary care physicians refuse to participate in Medicaid because of low payment rates and administrative hassles, urgent care centers and retail clinics also may not participate. Low participation in Medicaid by most providers likely means that reducing the volume of Medicaid patient ED visits will require new incentives from payers to involve a greater number and variety of providers. Ultimately, broader payment reform toward policies that emphasize provider accountability for populations rather than fee-for-service payment may encourage providers to invest in alternative settings where patients can get timely care for urgent problems without resorting to emergency departments. 1. Chalfin, Donald B., et al., “Impact of Delayed Transfer of Critically Ill Patients from the Emergency Department to the Intensive Care Unit,” Critical Care Medicine, Vol. 35, No. 6, (June 2007); National Quality Forum, National Voluntary Consensus Standards for Emergency Care—Phase II: Hospital-based Emergency Care Measures, Washington, D.C. (June 2008); American College of Emergency Physicians, Definition of a Boarded Patient, Policy Statement, Dallas, Texas (January 2011). 2. DeLia, Derek, and Joel Cantor, Emergency Department Utilization and Capacity, Research Synthesis Report No. 17, Robert Wood Johnson Foundation, Princeton, N.J. (July 2009). 3. Ostrom, Carol M., “State Medicaid Program to Stop Paying for Unneeded ER Visits,” The Seattle Times, (Feb. 7, 2012); Booth, Michael, “Medicaid Dispute Pits ‘Shared Responsibility,’ Care of Poor,” The Denver Post, (Jan. 29, 2012); Trapp, Doug, “CMS Denies Florida’s Bid to Raise Medicaid Cost-Sharing,” American Medical News, (Feb. 24, 2012). 4. American College of Emergency Physicians, “Frequent Flyer Study Being Used to Perpetuate Myth That Emergency Room Overcrowding is Caused by Patients with Non-Urgent Conditions,” News Release (April 2, 2009); Roser, Mary Ann, “Austin ER’s Got 2,678 Visits from 9 People Over 6 Years: Task Force Seeking Ways to Divert Non-Emergencies Away from Emergency Rooms,” The Statesman, (April 1, 2009). 5. Data on elderly patients are not presented because they often have multiple coverage sources, making comparisons by source of payment less informative. 6. American College of Emergency Physicians, “Health Plans and State Medicaid Officials Deny Coverage of Emergency Care, Misapplying a Research Tool, Says Research Author,” News Release (Feb. 27, 2012). 7. Because of insufficient sample sizes, triage acuity by payer source cannot be measured accurately. 8. Mehrotra, Ateev, et al., “Retail Clinics, Primary Care Physicians, and Emergency Departments: Comparison of Patients’ Visits,” Health Affairs, Vol. 27, No. 5 (September 2008). 9. Ku, Leighton, and Christine Ferguson, Medicaid Works: A Review of How Public Insurance Protects the Health and Finances of Children and Other Vulnerable Populations, The George Washington University, School of Public Health and Health Services, Washington, D.C. (June 2011). 10. U.S. Government Accountability Office (GAO), Medicaid and CHIP: Most Physicians Serve Covered Children but Have Difficulty Referring Them for Specialty Care, Pub. GAO-11-624, Washington, D.C. (June 2011). 11. Kaiser Family Foundation, Kaiser Commission on Medicaid and the Uninsured, Low-Income Adults Under Age 65—Many are Poor, Sick, and Uninsured, Policy Brief, Washington, D.C. (June 2009); Coughlin, Teresa A., Sharon K. Long and Yu-Chu Shen, “Assessing Access to Care Under Medicaid: Evidence for the Nation and Thirteen States,” Health Affairs, Vol. 24, No. 4 (July 2005); Mortensen, Karoline and Paula H. Song, “Minding the Gap: A Decomposition of Emergency Department Use by Medicaid Enrollees and the Uninsured,” Medical Care, Vol. 46, No. 10 (October 2008). 12. The percentage of patients seen in the ED with two or more chronic conditions is likely higher because this estimate does not count different conditions in the same diagnostic group, such as pregnancy and gestational diabetes. Also, physicians in emergency settings do not customarily record diagnoses for billing purposes that have no direct bearing on the reason for the visit. 13. Finlayson, Marcia L., and Elizabeth W. Peterson, “Falls, Aging and Disability,” Physical Medicine and Rehabilitation Clinics of North America, Vol. 21, No. 2, (May 2010). 14. Cheung, Paul T., et al., “National Study of Barriers to Timely Primary Care and Emergency Department Utilization Among Medicaid Beneficiaries,” Annals of Emergency Medicine, published online (March 14, 2012). 15. Authors’ calculations using data from the Center for Studying Health System Change 2008 Health Tracking Physician Survey. 16. Lowe, Robert A., et al., “Association Between Primary Care Characteristics and Emergency Department Use in a Medicaid Managed Care Organization,” Medical Care, Vol. 43, No. 8 (August 2005). 17. Authors calculations using data from the Center for Studying Health System Change 2008 Health Tracking Physician Survey. Specialists excluded those working most hours on hospital staff or in emergency departments and physicians in primary care specialties. 18. Kaiser Permanente, Oakland, Calif., California Primary Care Association, Sacramento, Calif., and California Association of Public Hospitals and Health Systems, Oakland, Calif., Preliminary Findings: Specialty Care Access Survey (January 2008); California HealthCare Foundation, Understanding Common Reasons for Patient Referrals in Difficult-to-Access Specialties, Oakland, Calif. (May 2009). 19. Weiss, Anthony P., et al., “Patient and Practice-Related Determinants of Emergency Department Length of Stay for Patients with Psychiatric Illness,” Annals of Emergency Medicine, published online (May 4, 2012). 20. Oster, Ady, and Andrew B. Bindman, “Emergency Department Visits for Ambulatory Care Sensitive Conditions,” Medical Care, Vol. 41, No. 2 (February 2003); Choudhry, Lina, et al., The Impact of Community Health Centers and Community-Affiliated Health Plans on Emergency Department Use, Association for Community Affiliated Plans, Washington, D.C., and National Association of Community Health Centers, Bethesda, Md. (April 2007). 22. Mortensen, Karoline, “Copayments Did Not Reduce Medicaid Enrollees’ Nonemergency Use of Emergency Departments,” Health Affairs, Vol. 29, No. 9 (September 2010). 23. Christianson, Jon B., et al., Economic Downturn Strains Miami Health Care System, Community Report No. 11, Center for Studying Health System Change, Washington, D.C. (September 2011). 24. Peikies, Deborah, et al., Early Evidence on the Patient-Centered Medical Home, Agency for Healthcare Research and Quality, Rockville, Md. (February 2012). 25. Berry, Anne, et al., “Why Do Parents Bring Children to the Emergency Department for Nonurgent Conditions: A Qualitative Study,” Academic Pediatrics, Vol. 8, No. 6 (November 2008); American College of Emergency Physicians, “Overburdened Primary Care Physicians Send Patients to the ER,” News Release (Oct. 15, 2011). 26. Mehrotra, et al., (Sept. 1, 2009). 27. Weinick, Robin M., Rachel M. Burns and Ateev Mehrotra, “Many Emergency Department Visits Could be Managed at Urgent Care Centers and Retail Clinics,” Health Affairs, Vol. 29, No. 9 (September 2010). 28. Association for Community Affiliated Plans, ACAP Fact Sheet: Ensuring Access Through Strong Provider Networks, Washington, D.C. (October 17, 2011). 29. Pollack, Craig E., and Katrina Armstrong, “Geographic Accessibility of Retail Clinics for Underserved Populations,” Archives of Internal Medicine, Vol. 169, No. 10 (May 2009). This study presents data on hospital emergency department (ED) visits from the National Center for Health Statistics 2008 National Hospital Ambulatory Medical Care Survey Emergency Department (NHAMCS-ED) public use micro-data files. The 2008 NHAMCS-ED is a national probability sample of visits to the emergency departments of general and short-stay hospitals in the United States, excluding federal, military and Veterans Administration hospitals. A national sample of hospitals is instructed to provide data for a systematic random sample of patient visits during a randomly assigned four-week reporting period, using clinical data from patient charts and hospital administrative data. The 2008 NHAMCS-ED includes 34,134 records provided by participating EDs. More detail about the NHAMCS-ED is available on the Centers for Disease Control and Prevention website: http://www.cdc.gov/nchs/ahcd/about_ahcd.htm#NHAMCS. NHAMCS-ED variables used in this study included expected source of payment, visit acuity and provider diagnoses. Payment source was recoded for this analysis into private insurance, Medicaid/CHIP, Medicare, uninsured (self-pay, no charge/charity) or other/unknown (worker’s compensation, other, missing, unknown). Visit acuity—the immediacy with which a patient needs to be seen—is based upon the initial assessment of the patient upon arrival at the ED by a practitioner (e.g., triage nurse) and fell into one of the following five categories: (1) emergent—patient needs to be seen immediately or within 15 minutes of arrival; (2) urgent—15-60 minutes; (3) semi-urgent—1-2 hours; (4) nonurgent—2-24 hours; and (5) no triage or unknown. Primary diagnosis is based on the first of three diagnoses listed for the visit as recorded by the main medical provider with some exceptions. More detail about how diagnoses were coded for this study is provided in the Technical Appendix. Denominators used in computing estimates of visit rates come from two sources. Private enrollment data were obtained from the 2008 National Health Interview Survey. The count included individuals reporting private coverage only as well as those with private and additional sources of coverage. Medicaid enrollment data are from the Medicaid Statistical Information System for fiscal year 2008. Medicaid enrollment equals the number of unique individuals—Medicaid eligibles—at any time during the fiscal year and is based on administrative data submitted by states to the Centers for Medicare and Medicaid Services. Emergency department visit data used in this study are from the 2008 National Hospital Ambulatory Medical Care Survey of Emergency Departments (NHAMCS-ED). Conducted by the Centers for Disease Control and Prevention, National Center for Health Statistics (NCHS), the 2008 survey consists of a national probability sample of visits to emergency departments of noninstitutional general and short-stay hospitals in the 50 states and the District of Columbia. For more information about the survey, see www.cdc.gov/nchs/ahcd.htm. The 2008 data include 34,134 sampled visits, representing approximately 123.7 million total emergency department visits. This study analyzes ED visits made by people aged 0 to 64 and includes 7,932 visits with Medicaid as the primary expected payment source and 10,548 visits with private insurance as the primary expected payment source. Data analyses were performed using SUDAAN statistical software to generate standard errors to account for the complex survey design. The survey instrument consists of a patient record form (PRF). Trained hospital staff completed a PRF following each visit to document key elements of the encounter. Key variables used in this analysis include provider diagnoses, whether the visit was related to an injury, expected source of payment and visit acuity. Provider’s diagnosis. Primary diagnosis and symptoms associated with the patient’s most important reason for the visit and up to two other significant diagnoses were recorded on the PRF. They represent the final diagnoses related to the visit according to the main physician’s best judgment at the time of the visit. The textual descriptions of the diagnoses were coded according to the International Classification of Diseases, Ninth Revision, Clinical Modification (ICD—9—CM). Injury. Hospital staff recorded whether the visit was related to an injury, poisoning or adverse medical event, as well as the patient’s verbatim description of the circumstances leading to the injury. Verbatim responses were converted by NCHS medical coders into (up to three) external cause of injury codes according to the ICD-9-CM Supplementary Classification of External Causes of Injury and Poisoning Codes (E-codes). Visits were classified as injuries if the injury checkbox on the patient record form was coded as “yes,” if any external cause of injury was reported, if any of the three reasons for the visit as reported by the patient were classified as an injury or if any of the three diagnosis codes fell into the injury or poisoning chapter of the ICD-9-CM. Payment source. Trained hospital staff referred to patients’ files or billing records and marked the expected payment source or sources for a given visit by marking the appropriate checkboxes on the PRF. Payment sources included private insurance, Medicare, Medicaid/Children’s Health Insurance Program (CHIP), worker’s compensation, self-pay, no charge/charity, other, or unknown. The PRF allowed for recording of multiple sources of payment, and the NHAMCS data file included an indicator variable for each source of payment. For this study, a primary expected source of payment was constructed by applying the following hierarchy: Medicare, Medicaid/CHIP, private insurance, worker’s compensation, self-pay, no charge, other, unknown.1 Consequently, visits with expected payment from both Medicare and Medicaid are assigned to Medicare, which is typically the primary source of payment for emergency services for dually eligible enrollees. The urgency of the visit was unknown in about 15 percent of ED visits in the 2008 NHAMCS data, because some emergency departments do not keep records of triage decisions and some triage decisions were not recorded. The same percentage of Medicaid and private visits have unknown urgency. Denominators used in computing estimates of visit rates are from two sources. Private enrollment data were obtained from the 2008 National Health Interview Survey (NHIS), which is the source customarily used in conjunction with NHAMCS data. The count included individuals reporting private coverage only, as well as those with private and additional coverage sources. Private enrollment estimates and standard errors for the specific age ranges used in this study were provided to the authors by NHCS staff. The nature of the NHAMCS data also factored into the decision to use MSIS enrollment data. Emergency department visits in the NHAMCS are sampled from hospitals administrative records, which include visits by individuals who are outside the scope of the NHIS sampling frame (such as institutionalized and homeless people). Thus, a denominator based on administrative data is a more appropriate choice for this study because of the administrative source that underlies the numerator. To illustrate the impact of using administrative vs. survey data for enrollment counts, emergency department visits rates per 100 Medicaid enrollees were computed using both NHIS and MSIS data. The Medicaid visit rate for adults aged 21-64 was 72.4 visits per 100 enrollees using NHIS data and 45.8 visits per 100 enrollees using MSIS data. Thus, using the administrative source shrinks the difference in visit rates between Medicaid and private insurance by 27 visits per enrollee (or roughly 55 percent). This method does not, however, change the distribution of visits by source of payment (i.e., percent of visits that are nonurgent), because these estimates do not rely on the size of enrollment. As a result, visit rates for Medicaid enrollees in this study are lower than previously published visit rates but are believed by the authors to be more accurate. 1. The current version of the 2008 NHAMCS data file includes a constructed summary variable, PAYTYPER, with the same hierarchical assignment used in this study. However, at the time data analysis for this study was performed, a different summary variable was present in the data—PAYTYPE—that employed a slightly different hierarchy and did not match the definition used in previous years of the survey. Consequently, the authors constructed their own hierarchy, as described. 2. Ozminkowski, Ronald J,. et al., Private Payers Serving Individuals with Disabilities and Chronic Conditions, The MEDSTAT Group, U.S. Department of Health and Human Services (January 2000). 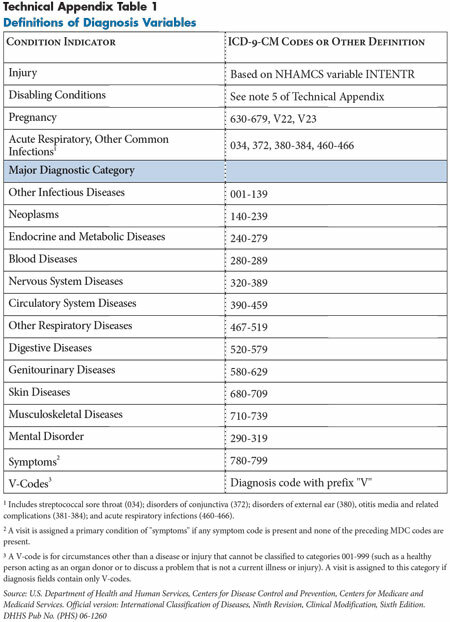 See Appendix Tables A-1 and A-3 for lists of diagnosis codes associated with potentially disabling physical conditions for adults. These lists were modified slightly by the authors according to clinical input from an emergency department physician. The modified list is available from the authors on request. 3. Note that the multi-stage process defining PRIMCOND prioritizes injuries and then disabling conditions, pregnancy and viral conditions over other diagnosis categories—i.e., the presence of these diagnoses in any of the three diagnosis fields “trumps” all other diagnoses. For example, if the primary diagnosis (DAIG1) for a non-injury visit is a skin condition, while the second diagnosis (DIAG2) is pregnancy related, the visit will be classified as PRIMCOND=2 (pregnancy). 4. State Health Access Data Assistance Center, Phase IV Research Results: Estimating the Medicaid Undercount in the National Health Interview Survey (NHIS) and Comparing False-Negative Medicaid Reporting in NHIS to the Current Population Survey (CPS). 5. The MSIS Medicaid enrollment counts included people dually eligible for Medicare and Medicaid coverage, even though ED use by dual eligibles is typically covered by Medicare. The result is a visit rate that reflects each program’s obligation for its population. The inclusion of this population makes little difference for children aged 0-12 and teens/young adults aged 13-20, where dual eligibles comprise 0.1 percent or fewer of Medicaid enrollees. Dual eligibles account for 16.3 percent of Medicaid enrollees aged 21-64 and about 6.5 percent of total Medicaid enrollment among people aged 0 to 64.